The fog came again for beaters day at Mountainstown. Winter was not quite ready to relinquish her grip and she threw her veil across the countryside holding everything immobile in her grasp. As everyone gathered in the courtyard the weather, possibly, reflected how many of us felt. 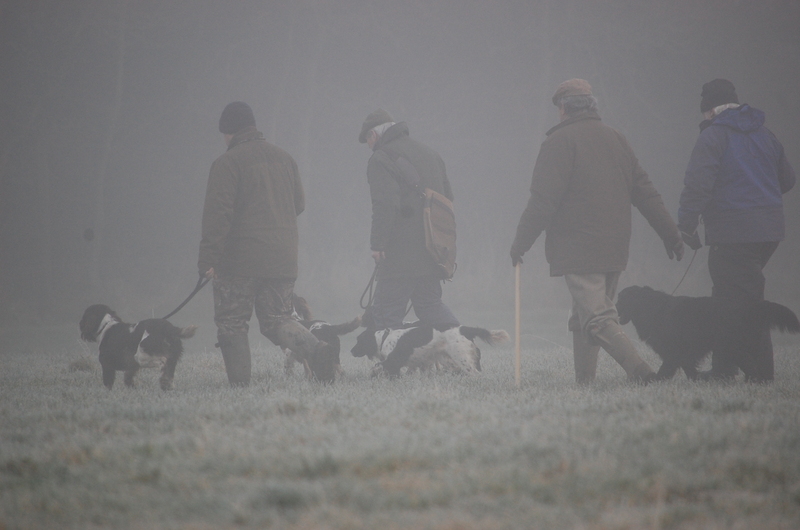 Beaters day, although exciting, also reminds us that shooting season is coming to an end. It is bittersweet… and so today the fog that wrapped itself around the old house was welcome. We could forget the promise of spring for a while and focus on enjoying the camaraderie that makes this shoot such an enjoyable place to spend the Winter. I had decided not to shoot on this day. My plan was to work my dog and take plenty of photos as the action unfolded throughout the day. Alas, the weather put paid to much of my photography as my lens struggled to make contact with the Guns on pegs through the fog, besides something else rather unexpected caught my attention. I had been given the radio for the day in case James needed to contact the picking up team at any stage. As we loaded ourselves onto the picking up cart and followed the Guns’ wagon out of the yard the radio chattered away as it hung around my neck. 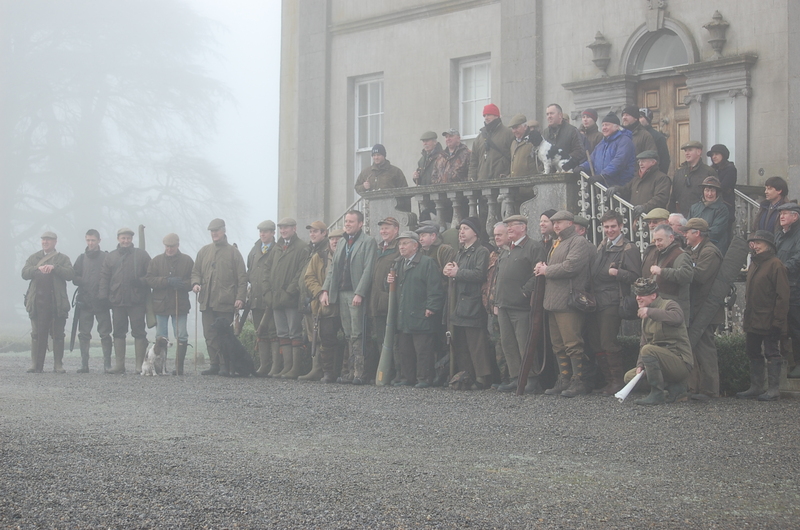 Conversations between James (the keeper) and Rupert (the shoot manager) interspersed with reports from Demise, Gavin and Donal as each of them took their teams to various points from where they would start moving birds towards the allocated drive. The names of the drives are engrained in my memory after so many seasons – Cowfield Wood, Arthurs Hill, The Fish Pond, Romwood and the Garden Paddock- each one means something different in relation to picking up, knowing which way the birds will come, where the heaviest shooting will be, where the birds are likely to fall and how near or far the Picker needs to stand from the Gun. As I took up my spot at the Keepers pen that morning, the radio was giving me an insight to what happens on the beating line. Rather than being a nuisance I was transfixed with the dynamics that were unfolding across the airwaves. Each team will have taken their birds in from a different direction, sometimes a long way out from where they will eventually flush from. As the teams converge pressure is applied on the birds in different directions, slowly at first by just the tapping of a stick or the cracking of a flag birds may move and flush with very little prompting. This will give the guns time to prepare, a chance to take an early shot and settle the nerves. Everything was coming together across the airwaves, birds were breaking nicely in a variety of directions and despite the fog were flying very well. The teams had merged now working forward slowly and steadily..stop…flush…tap…forward…flush…stop….tap…more pressure applied on the right to spread the shooting evenly and all the time the flow of conversation continued between James, Demise, Gavin, Donal and Rupert, all the time the control rested with James…nothing or nobody moved unless on his say so. Fifty birds in the bag at the end of the first drive and smiling faces as Rupert passed around the port. Once again, James and his team had delivered. They had not failed all season and I looked forward to listening in as the plot was revealed for the next drive. The moment when that first flush of pheasants fly out over the guns is the end result of a lot of long, long hours of preparation, planning and teamwork. 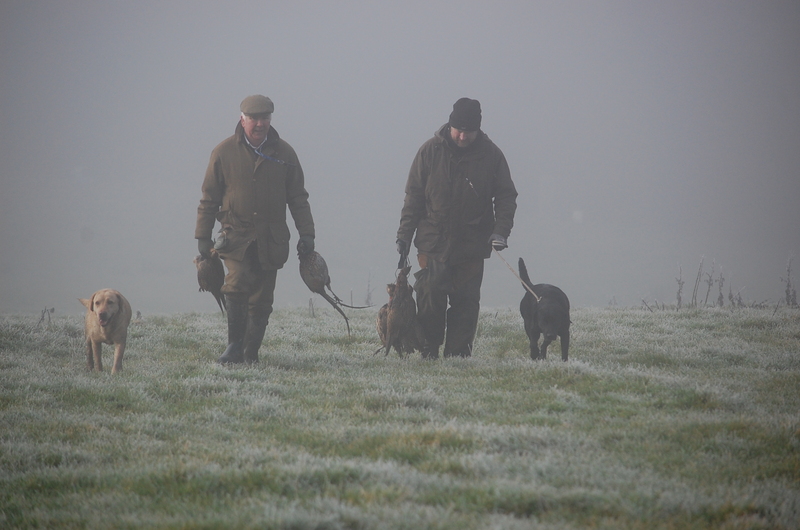 There are several key players that help bring this about but what makes a shoot succeed or fail undoubtedly falls on one person’s shoulders, the Gamekeeper. Everything starts and stops with him. It is a universal thing, it’s why Alex ferguson has held the reigns at Man U for so long, for example. There can be only one leader but a good leader recognises that he alone cannot bring about success. His loyalty and respect for his team are unquestionable and perhaps this is the secret to a shoot’s success. The end result, to an enjoyable day…birds in the bag. 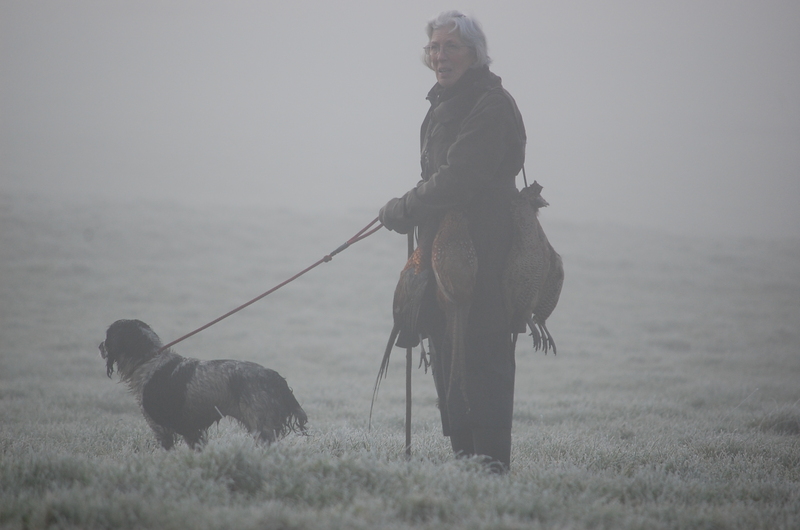 This entry was tagged gundogs, hunting, shooting, short post, winter, writing. Bookmark the permalink. ← Are breeding decisions being based too much on health checks? As you know, I’ve been beating this year. It’s been a revelation. Firstly, despite his doing very few retrieves, I’ve learned quite a bit about my retriever, Stevie, who accompanied me on the beats. While I did send him when required, the lack of retrieves meant that I got to study him as birds flew, shots rang out from it seemed every direction and birds fell over a huge area. I think I’ve a better idea of how he reads the situation. I’ll tell you about that soon. Secondly, I was up close to what you were hearing on the RT and most of the time I was within earshot of someone’s radio. I’d been beating before – years ago – but this different. The difference to some extent was determined by the ground; there was no wide front, no long line coming through acre upon acre of cover. Here outlying pheasants were pushed along hedgerows with narrow bands of cover to join greater numbers holed up in relatively small areas of cover, sometimes dense but always accessible. The beat here was sophisticated and used groups of beaters converging. Once close contact was made with the birds, everything was slowed down: advance ten, all stop, wait, keep tapping, forward another ten … As soon as birds began to flush, it was stop (Can’t have them all out in a huge flush.) Gently forward, giving a series of small controlled flushes. This was more part of the months of husbandry than hunting. As you say, it was all so well done. Mind you, they damn nearly killed me. Apart from the strains on my ageing city-adjusted body, there was the time I sank to my foldies in a patch of soft ground and had to be hauled out – but that too is talk for another day. Right now it’s thanks to the cheerful, friendly and very professional men you mentioned and to all those who participated. Incidentally, have look at that large group picture taken in front of the house. Notice how discretely Barbour have introduced their new blue range – and their fetching new red hats. Thanks Colum, yes I agree the terrain definitely calls for a more disciplined and organised approach to beating in Mountainstown , which makes it all the more fascinating.